Ulanbek Egizbaev. Photo from personal archive. A review of Ulanbek Egizbaev: In Search for the Truth (2018). In summer 2018, the sudden death of a prominent journalist in Kyrgyzstan caused a rare display of public grief. 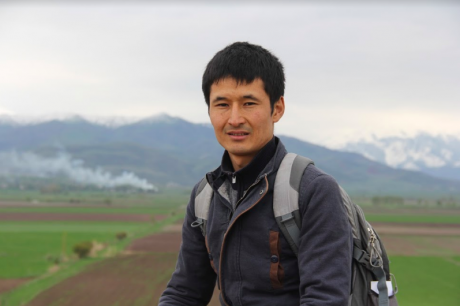 Both in the country and among Kyrgyzstanis working abroad, public tributes were paid to the life and work of Ulanbek Egizbaev, 28, one of the country’s leading investigative journalists. Egizbaev drowned on 22 July while vacationing with his family at a resort on Lake Issyk-Kul, a top tourist destination in the country’s east. Egizbaev made his reputation through his investigative reports broadcast on Azattyk television in the Yngaysyz Suroolor (“Inconvenient issues”) programme in the Kyrgyz language. Following Egizbaev’s joining the segment in 2013, his investigations on corruption among government officials often spurred wide public discussions and more than a few outcries. While there is a significant difference in media usage habits and language between the regions of Kyrgyzstan and the capital Bishkek – in the former people consume media in Kyrgyz; in the latter Russian dominates – television remains the main source of political information in the country. Speaking in his native Kyrgyz on television, Egizbaev’s work reached a greater audience outside the capital, where most of the best investigative journalism is still produced in Russian. Aizada Kasmalieva, director of Azattyk, recalls Ulan’s first steps as an investigative journalist: “When he first came to Azattyk, he was a young journalist searching for himself,” so he didn’t shun a challenge. Egizbaev’s first break came with Azattyk+ TV, a youth programme for which he first reported on the rights of disabled people. But instead of fitting into the youth programme genre, Egizbaev produced an investigation, a precursor of more to come, as In Search for the Truth testifies. The collection includes reports on corruption schemes in customs, public contracts and land distribution, involving government officials as well as various ministries. One investigation, for instance, exposes the illegal sale of land to build luxury apartments in Bishkek. Ikhlas, the company in charge of the construction site, is rumoured to be connected to Ikramjan Ilmiyanov, a close advisor to former President Atambayev. Ilmiyanov is currently in custody. Another report by Egizbaev digs into the Kyrgyz authorities’ misreporting of the volume of exports between China and Kyrgyzstan in 2015. While the Chinese authorities declared the 2015 turnover in goods to amount to be approximately $4.3 billion, the Kyrgyz side instead reported a figure more than four times lower, at $920 million. Officials at the Kyrgyz Customs explained the huge divergence in terms of methodology in calculating the value of goods. However, experts estimate that about 15 billion soms (more than $200 million) have been lost in this scheme. In yet another investigation in 2018, Egizbaev revealed the illegal sale of burial plots at Bishkek’s south-western cemetery, despite the fact that graves are supposed to be free. The report included allegations that the Bishkek City Mortuaries and Funeral Agency sold cemetery plots for the equivalent of hundreds, or even thousands, of dollars. Apparently, the price depended on the religious denomination of the buyer and/or whether he belonged to a minority community. Egizbaev’s reportage was met with outrage by the public. The General Prosecutor opened a criminal case; the investigation in ongoing. In between corruption investigations, Egizbaev also found time to cover stories of everyday people in Kyrgyzstan. His short documentary film Dream, about the daily struggles of Nurgazy, a wheelchair-bound student, received a prestigious Webby Award – the Internet’s highest honour. According to Azattyk, in recent times Egizbaev had received phone and email threats in connection with his work. This prompted speculation on social media that the 28-year-old reporter may have been killed. Eyewitnesses remember him struggling to swim near a dock, but no lifeguard was on duty at the beach at the time. Instead, it took a lifeguard and a nurse about 15 minutes to tend to Egizbaev after he had been pulled from the water. He was declared dead at a local hospital. A Ministry of Interior’s investigation concluded that the cause of death was “drowning”. A criminal case against the owners of the Akun resort into “provision of services that do not meet safety requirements”, is ongoing. Following the journalist’s death, some of Egizbaev’s colleagues joined forces with former President Roza Otunbayeva to establish the Foundation for Investigative Journalism, whose goal is to support investigative journalists exposing corruption in the country. The Foundation will be funded by private citizens; Otunbayeva was the first to contribute a donation of one million soms (approximately $15,000). President Jeenbekov has also passed a new law protecting persons who report corrupt activities.